Before, websites used to compete for the number one position in search results — and they still do. Now, however, there’s more of a demand to capture the featured snippet for a search query. Why? Getting your page featured can earn you up to 8.6 percent more clicks from your target audience. The question is, how do you get a featured snippet? Before we dive into earning a Google snippet, let’s look at the who, why, and what of featured snippets. In 2014, featured snippets started appearing at the top of search result pages. Their goal? Answer user search queries with relevant information fast. That’s why they pull a summary answer from one of the top-ranking pages and display it, as well as include the page title, page link, and page URL. Paragraph: This type of snippet appears in a paragraph format. List: This type of snippet appears in a list format. Table: This type of snippet appears in a table format. 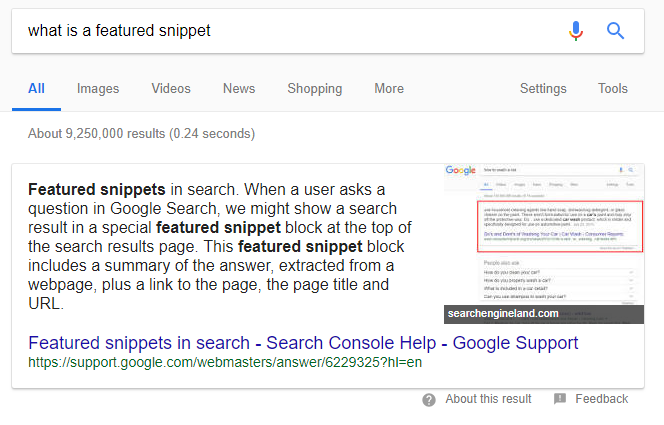 In the beginning, featured snippets only included text. Now, they include text, images, and video. A recent study discovered that featured snippets are often from high-ranking pages. For example, more than 30 percent of featured snippets come from the number one page, while less than 0.5 percent of snippets come from the number 10 page. That’s why you’ll need to boost the ranking of your page if you want to earn a Google snippet. With 200 factors influencing your ranking on Google, it’s a challenge to determine where or how you can improve. While you may look at domain factors, as well as brand signals, you’ll probably focus most of your energy assessing on-page factors, user signals, and backlink factors. Improving your content’s ranking takes time, but it can deliver big returns if you nail it. A piece of advice you’ll often hear with featured snippets is that you should try to rank for multiple snippets. Why? Today, pages that earn one snippet are more likely to earn another one for a related search. 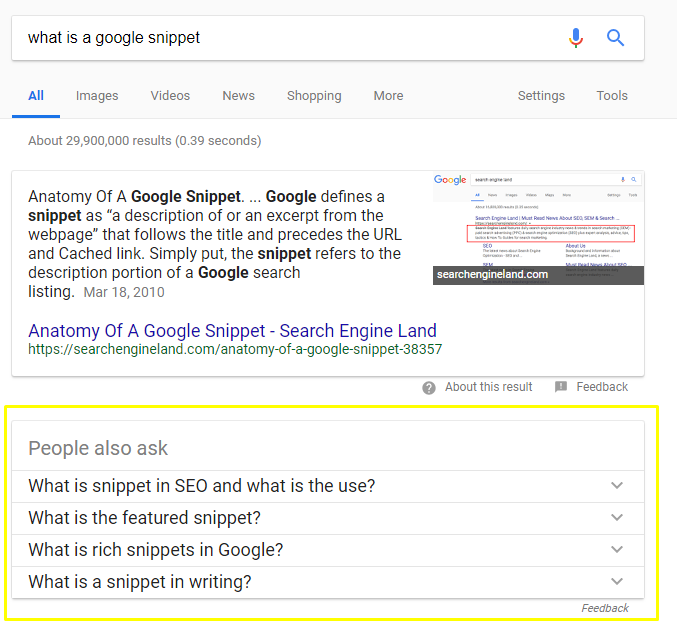 If you’re answering a question about Google snippets, for example, research related questions that your page could answer. A lot of times, Google will even provide you with a list of related user questions that have snippets. Unsure about what terms may have featured snippets? Try focusing on questions, as they encompass more than 40 percent of snippets. Comparison keywords are another excellent area to look at, as more than 20 percent of comparison keywords have a Google snippet. Researching your audience is another strategy for improving your featured snippet and finding additional snippets to target. If you’re operating in an industry that’s dependent on acronyms, for instance, see if there’s a high search volume for the full-name of those acronyms. Take the earlier example of a related featured snippet, “what is snippet in seo and what is the use.” SEO is an acronym for search engine optimization. See if there are similar instances in your industry, and then optimize for them — but only if it makes sense for your business. After you’ve compiled your revamped keyword list, as well as your to-do for page ranking improvements, you can start revising your page. When you create content for a featured snippet, you want to make it as easy as possible for Google to pull that information. That’s why you need to keep your answers concise — and within 40 to 50 words. If you’re creating a list or table, you’ll want to follow a different rule. Instead of 40 to 50 words, a list should have a maximum of eight items. For tables, you want to have a maximum of nine rows and three columns. Marketers, however, recommend exceeding that table and list maximum. The reason is that — if you earn that featured snippet — Google will display the maximum number of items, such as eight for a list, and then display “More items,” which encourages users to visit your website. Depending on your experience with SEO, you’ve probably incorporated headings and sub-headings into your content already. If you haven’t, make sure you do. It’ll break-up not only your content but also improve your featured snippet chances. For reference, you can access headings for your content in Microsoft Word, as well as WordPress. Due to your limited word count, it’s critical that you keep your snippet content to-the-point. Read through a few featured snippets — for any topic — and you’ll see that they’re all straightforward. Imitate that in your content. While you won’t earn a featured snippet overnight, it’s critical that you keep an eye on the performance of your pages. With a variety of tools available, from Google Analytics to Ahrefs, you can track how you’re doing. Plus, you can target areas for improvement. With a Google snippet, you can bring more traffic to your website, which can lead to more business. That’s why they’re worth investigating when brainstorming and creating new content for your website and blog. Looking for results? Call WebpageFX, 888-601-5359, the results-driven digital marketing agency. Our award-winning SEO combined with industry-leading digital marketing has generated millions of leads and a billion dollars in revenue to our clients. We know we can help you grow!